There are bike convoys to the Paris climate summit both from within France but also from other countries, yet as a group of people with a political message they are in breach of the law against protest. 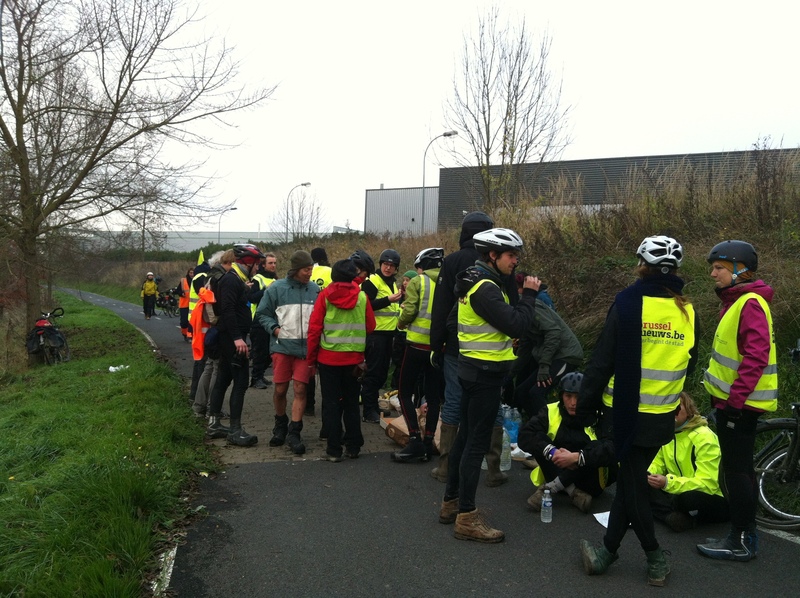 I met up with the Belgium Climate Express group as they continued on after they were forbidden from entering Paris. Their banner reads “We continue”. The 300 strong group from Belgium found themselves without accommodation or food after the police pressurized their accommodation into not letting them stay. The group ranged in age from 18 to 56 and many people had not been involved in a long distance ride or public political expression before. 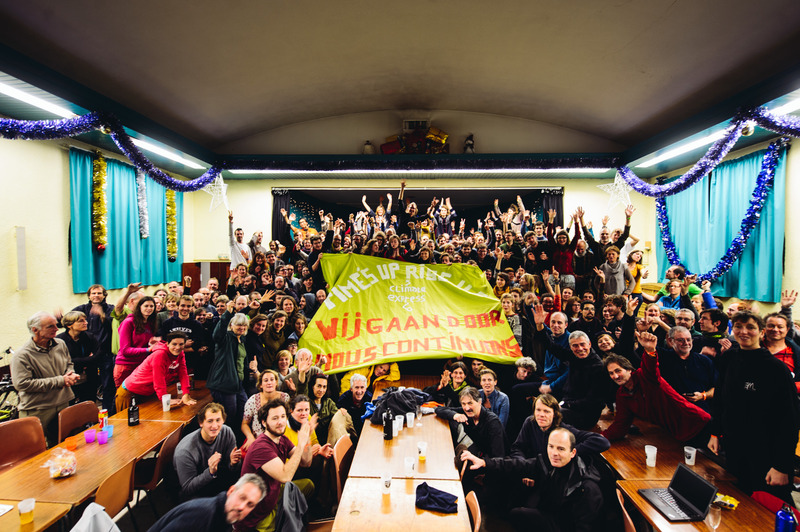 130 people decided to return to Belgium whilst 170 continued on, doing an epic two days worth of cycling in one day, splitting into small groups to make it into Paris. 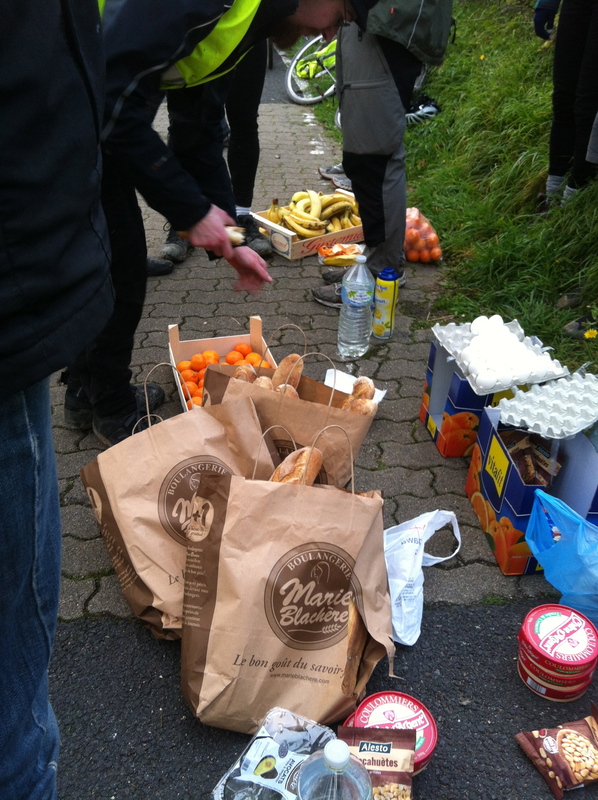 Sama and I joined their contact in France as he took food out to the group and we met them en route along the canal. Bike convoys are a great way for people to express their passion on an issue, travel low carbon, challenge themselves and get together with other allies. The bike convoy from the UK Time to Cycle will be leaving next week and we can expect similar challenges for them to enter the country and make it to Paris. I am grateful that I am not a crow. However, it does constrain my route options. The fact is footpaths aren’t always going where you want to go, meaning often you do have to use the roads. Previously I would have been a fan of sustainable transport schemes which separate cyclists, pedestrians, motorists etc, and in some cities I still might be, but the bulk of the country can’t accommodate that policy. What happens when you retreat from the roads is that motorists don’t expect to see you there, so they drive faster. People who have no choice but to use the roads then have a more dangerous place. I’m not suggesting that you go out and walk along your nearest busy A road alone (it’s not fun and rather scary) but if you look on your OS map you’ll find the roads are colour coded. Yellow seems to be quite narrow so cars go a lot slower, light orange might be a bit busy (a car every few minutes), dark orange will probably be stressful and a bit risky and red they’ll be gunning for you. So I would heartily recommend yellow coded roads, light orange too especially when you’re highly visible, to remind people in cars that other types of transport are used on roads. A couple of days ago I was walking through the woods when I came accross a beautiful shire horse, all harnessed up. It turned out that he was being used to drag Sitka Spruce trees out from the wood to increase bidiversity and for use in a biomass boiler! The man conducting the operation was John Williams who was well aware of the value of maintaining traditional practices. We’ll have more of a use for these horses as fossil fuels decline with peak oil. You can see the horse in action here. Then just yesterday I met Jonathan who runs a gorgeous B&B called Higher Bidicott Farm, where he farms with horses and has done all his life! He trains around three working horses a month for other people so that they can be used on other farms too. By accident I stumbled accross E & TVR. These mysterious letters signify the Exeter and Teign Valley Railway. A railway that was dismantled not because it was unprofitable or because it was unused, but as part of a government policy which happened decades before I was born. Colin Burges has made it his lifes passion to campaign for a reinstatement of railways, especially those that are largely still intact. He sees a future where cars are off the road and people and goods are back on the rails. The E&TVR visitors center is a whimsical and sometimes darkly funny look at his love of the railway and desire for a more environmentally conscious transport policy – the thing that caught my eye was a crushed car labelled “The only green car”! I spent the night in the beautiful minature railway car, Tadpole, which was lovingly made by Colin and normally sleeps children whilst adults often book the larger Toad. As well as the restored line, loading yard, and information hut there is also a small rail car that children can take rides in. Located next to a beautiful river, it’s a very peaceful spot. Lush threw us a fundraiser in Oxford this weekend, raising £57 for us with sales of their Charity Pots. Then we visited bike co-op Broken Spoke, and set out along the beautiful canal and Port Meadow and passed the ruins of Godstow Nunnery. 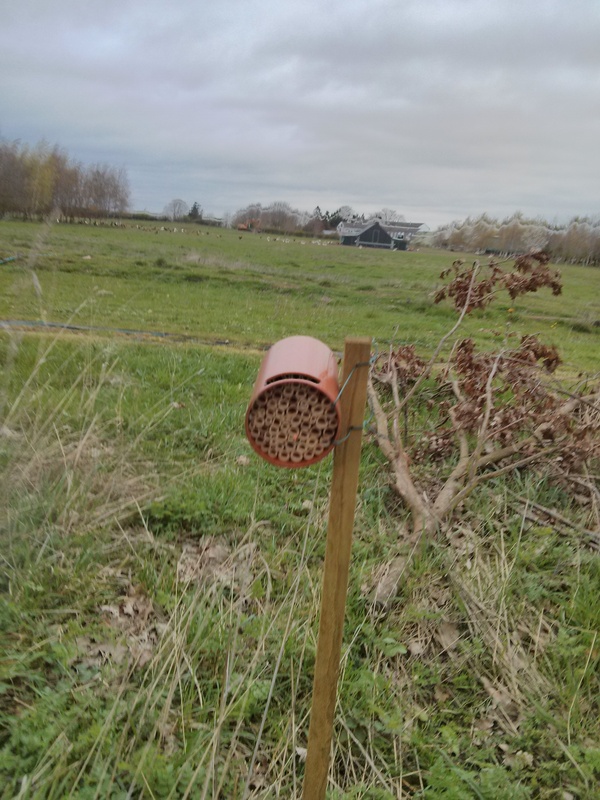 Further out we found Fai Farms providing artifical bee homes. You could provide living space for bees in a similar way. We passed Wytham Woods a Site of Special Scientific Interest where the habitat is being preserved. In total the four of us walked about 35km, mostly on the second day which was a good long practice! On our practice walk this weekend we visited the biking co-operative Broken Spokes in Oxford. Co-founder Elle Smith tells us about forming the group. One of the striking things about a visit to Oxford is the thousands of bikes, chained to everything. It’s common to see women in skirts and smartly dressed people cycling to work, as well as the thousands of students. Broken Spokes savages bike and helps people repair their own bikes by providing knowledge, space and tools. They also help people to take up cycling, and provides a great community hub. We meet Owen who is cycling to Austrailia and Dave Thomas, Green Party Candidate for Holywell Ward Oxford.